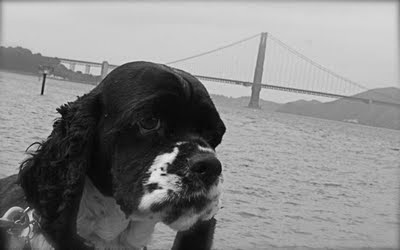 I am spending a lot of time in San Francisco lately, and yesterday my loyal pooch and I set off to explore the Ggnra Yacht Harbor at the Marina. She climbed the rocks, and I took some fun photos of the Golden Gate Bridge. For more great photos, check out DeliciousBaby.com's Photo Friday. happy pooch!! what a fun shot! How cute is that dog! Does he know how lucky he is to be standing in front of the Golden Gate? Hi! Just want to say thanks for visiting my choir blog! I love that you blog about travel and music. My two favorite things! That cute one looks like he has seen a lot of traveling. Great shot! Ah, your doggie looks so serious! Having serious fun, right?